We offer a range of connectors, cables and adaptors to complement and connect our control units and electrodes. We also offer adaptors that allow a number of other units and electrodes from manufacturers to be connected with our equipment. Because of the numbers of E-Stim/TENS control units on the market there is nearly always some confusion as to the nature of the connections. We try to ensure that all of our equipment uses some form of 'standard' connector, and we then offer a range of adaptors for the more exotic non-standard equipment. A 4mm cable is needed. 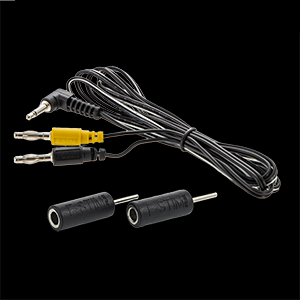 The majority of quality E-Stim kit will use some variation of the 4mm banana plug and a 3.5mm mono jack. 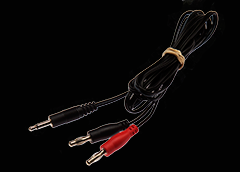 Equipment that is related to TENS equipment will generally use a TENS pin on one end, and some form of connection on the other. Equipment at the cheaper end of the TENS market even does away with the connection to the control box and offers the 'hard wired' option...the cable just enters the box. Cheap and not very durable, and an issue if you want to replace the cable for a longer version. Our Standard control units use 3.5mm mono jack sockets. The other end of the cable (the connections to the electrodes), will either be 4mm colour coded plugs or 2mm colour coded plugs. We can also provide lower profile 4mm right angled plugs which are designed to work with our larger premium electrodes for a more discreet fitting. Many people use TENS units for E-Stim play, but with varying degrees of success - after all they are designed to remove sensation, not to enhance it!!). These are normally fitted with 0.080" pin connections. (the so called TENS plug). Our 2mm cables will fit into the socket designed for a 0.080" TENS plug, but 0.080" TENS plugs will not always fit into our 2mm adaptors. If you wish to use an electrode with a TENS unit then we suggest you use a TENS to 4mm adaptor, or if your TENS unit uses the round tens plug, then consider the TENS to 4mm Cable. However msny TENS units don't have the power necessary to drive our larger electrodes.